Chinese government announced that Shin-ichi Kurokawa, professor emeritus at KEK, Japan, and vice president of Cosylab, was given the International Science and Technology Cooperation Award of the People’s Republic of China on 18 January 2013. 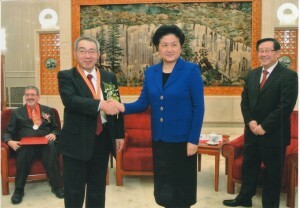 After receiving the Award for International Scientific Cooperation of Chinese Academy of Sciences in 2011 and the Friendship Award of China in 2012, Kurokawa has now received the International Science and Technology Cooperation Award of the People’s Republic of China, in recognition of his great contribution and dedication to China’s accelerator science development. The International Science and Technology Cooperation Award of the People’s Republic of China was formally set up by the State Council in 1994. According to the Regulations on State Science and Technology Awards, this prize shall be conferred on foreigners or foreign organisations that have made important contribution to China’s science and technology undertaking and development. This award shall be conferred on no more than ten individuals or organisations each year. This year five foreign scientists from four countries have received the award: one from Japan, two from the US, one from Denmark, and one from Canada. Kurokawa also worked for the promotion of the ILC. He chaired the Asian Committee for Future Accelerators (ACFA) in 2004-2006, the International Linear Collider Steering committee (ILCSC) in 2005-2007, and the Asian Linear Collider Steering Committee (ALCSC) from 2007-2010. “It is really a great pleasure for me to hear Professor Kurokawa’s winning the national top prize of the International Science and Technology Cooperation both as his friend and his successor of Asian Linear Collider Steering Committee Chair. The prize is not only for the achievement certainly, but also for the winner’s great spirit for the good of humankind and peace in general, which are the true values of Science and Technology development,” said Gao Jie, member of the future Linear Collider Board, chair of the Asian Linear Collider Steering Committee and chief scientist of the ILC group at IHEP in Beijing, China. Born in June 1945, Shin-ichi Kurokawa is a world-famous particle accelerator expert. He has chaired several international committees on accelerator science and also received the Rolf Widerøe Prize in 2011, the top international award in the field of particle accelerators. He has initiated the collaboration between Japan Society for the promotion of Science and the Chinese Academy of Sciences in the field of particle accelerators and served as the coordinator for the Japanese side. He has made great efforts in promoting the personnel exchanges and cooperative researches between two countries. Since the 1980s, he has made more than 60 visits to China to actively promote collaboration with the Institute of High Energy Physics, the Shanghai Institute of Applied Physics, Tsinghua University, Peking University, University of Science and Technology of China and other Chinese research institutions. He also helped IHEP to upgrade the Beijing Electron Positron Collider (BEPC) to BEPCII, transferring the superconducting accelerating technology used at the KEKB accelerator to China. He also served as a member of the Machine Advisory Committee for BEPC II and provided many valuable comments and suggestions. He has made significant contributions to the construction of large-scale accelerator facilities in China and to their catching-up with the world-class level.